Choosing different route could be a right decision. Avoiding traffic jam on the main road, we took alternative route that allowed me to capture interesting view. There are teak trees along the road and uniquely, the bare ones are only located on one side of the road. How strange. But the bare trees have such great shapes. The photo is very nice! Funny that have leaves aside and across're naked! Nice photo. 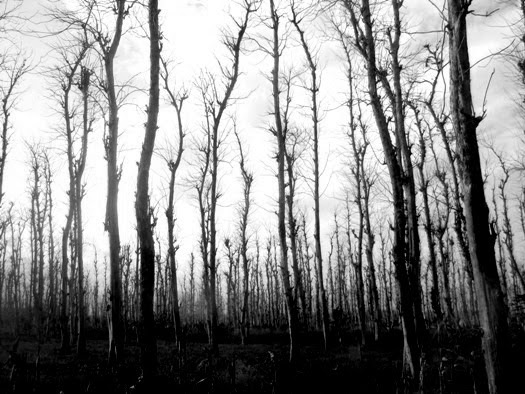 Eerie feeling,would make me think twice about walking through these woods. :-) I wonder why the bares ones are on just one side. Wonderful photo in B&W! Very well captured! they do look nice. But I an surprised they are so slim. I thought they woul be much sturdier. Wonderful shot of the trees. Just wanna say.. wooww it's cool..! what a beautiful picture. Really want to see that in real.